In 2004, no reliably attested ancient cave art had been found anywhere in England. Many people, ourselves included, had argued that it was highly unlikely any would be found. However, the discoveries by Bahn, Ripoll and Pettitt (Bahn et al. 2003), whilst still the subject of some controversy (Bednarik, 2005; Ripoll et al., 2005), provided the necessary catalyst for new investigations and led directly to the discoveries outlined here. We are fortunate to live near the Mendip Hills, an area rich in Palaeolithic and Mesolithic archaeology, most of which has been discovered in caves including those at Cheddar, where rich Creswellian deposits have been excavated over the years. We therefore decided to put the experience we have gained over the last 15 years in the study of the French caves into practice. On 6th July 2003 we visited Aveline's Hole, Burrington Combe, and spent several hours examining the walls, with the aid of LED lights. 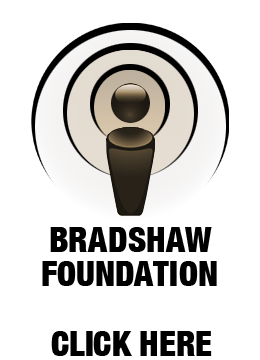 At that time, we were searching for representational art and the site contained nothing which could fall into that category. We did, however, notice and photograph a series of engraved lines, which were quite different in appearance from the modern graffiti on various parts of the cave walls. Shortly afterwards, whilst reporting on the progress of the project to Dr. Roger Jacobi of the British Museum, we mentioned the engraved lines and their appearance of age and were surprised at the interest they generated in him. He drew our attention to a number of parallels in the French Mesolithic record and also other examples of simple geometric designs from the same period (see, especially, Hinout & Angelier 1968 and Tassé 1982). We therefore undertook a process of attempted verification, which included site visits from Roger Jacobi; Jill Cook, also of the British Museum; George Nash, who has studied Mesolithic rock art in Scandinavia, and Alistair Pike, who was responsible for the dating work at Creswell. Photographs were shown to Jean Clottes and to Paul Bahn. Alistair Pike's examination determined that direct dating methods could not be used as there is an insufficiently clear stratigraphic relationship between the engravings, the calcite layers and the bedrock. We were then left with the characteristics of the lines themselves, the differences between the engraving and modern graffiti and most importantly, the archaeological context of the site itself on which to form an opinion. At the end of this process a consensus was reached that the engravings were unlikely to be recent. A report was submitted to English Heritage, the Government organization charged with the protection of Ancient Monuments, in advance of any publication. 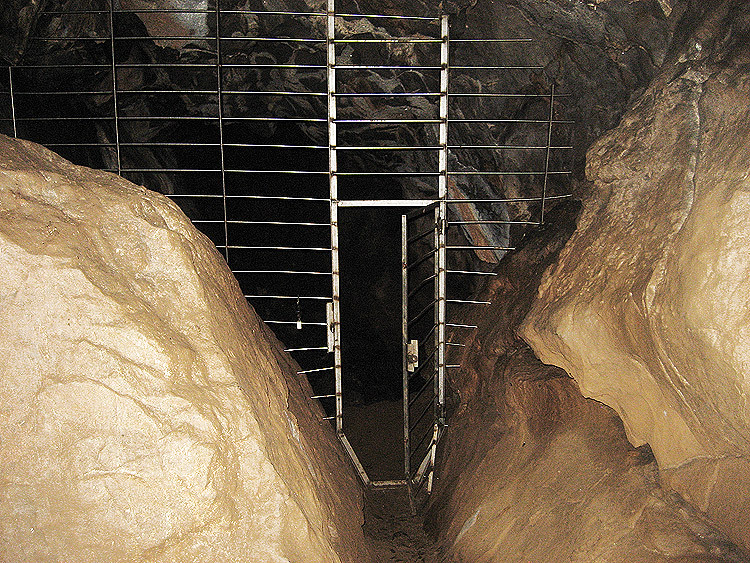 Following their own independent investigations and consultations, English Heritage concluded that the site justified protective measures, and a gate was installed in the rear portion of the cave, with the agreement of and assistance from English Nature, the Mendip Hills Warden Service and the landowner, Sir David Wills. The University of Bristol Spelaeological Society, of which we are members, has a long history of involvement with Aveline's Hole and has been given responsibility for maintaining access to the site. The key to an understanding of Aveline's Hole is its archaeology and its history. 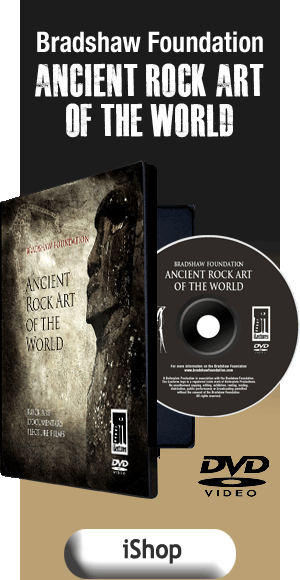 The archaeology has recently been the subject of an in-depth reassessment by Schulting (of the skeletal material) and by Jacobi (of the stone industries). This work will be published towards the end of this year (Schulting, in prep. ; Jacobi, in prep.) In short, they have shown that after a history of use by Late Upper Palaeolithic hunters, the site was re-used in the Early Mesolithic as a cemetery. The latter usage was intensive, over 50 bodies were interred in the cave, and quite short, probably over about 120 years. After this the cave was sealed, probably intentionally, and, save for a very small ingress of material later in the Mesolithic. It remained sealed until its discovery in January 1797. In view of this history, it is clear that any engraving on the cave walls is either less than 200 years old or at least Mesolithic in age, possibly older. For reasons which will be given below, the view was that the engravings were older than 200 years. In view of the strong Mesolithic associations of the site and also on the basis of stylistic comparisons, we have attributed them to the early Mesolithic. However, as direct dating is currently impossible, this can never be more than a provisional statement. The engraved panel consists of two rows of crosses with six in the upper row and four in the lower. The panel is approximately 25 cm wide and 20 cm high. At first sight the crosses seem to form a continuous lattice, but although the lines are sub-parallel and come close together, each cross does form a distinct image. The engraved lines are approximately 1 mm wide and shallower than they are broad. They show a slight asymmetry in width and unevenness in depth, characteristic of having been made with a stone edge rather than with a metal tool. Close examination shows that in each case where the sequence is clear, the line running from upper left to lower right was cut before the line from upper right to lower left. 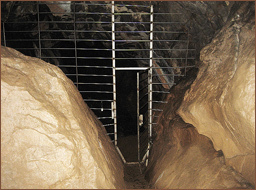 Parallels can be drawn from Upper Palaeolithic sites such as Grotte Cosquer and later, from Gabillou. Probably the closest British parallel is the Late Upper Palaeolithic engraved horse jaw from Kendrick's Cave. However, as the Mesolithic saw the most intensive use of the cave, we feel that the most reasonable attribution for the art is to this period, as it is also the case that most known Mesolithic decoration is of a similar abstract design. The second site which has yielded engravings that may be of a similar age is Long Hole. This is one of a series of caves at the downstream end of Cheddar Gorge, in Somerset, which are found at different levels having been abandoned in turn as the underground river which formed them cut deeper and deeper into the limestone (Farrant 1991). Many of these contain deposits of Late Upper Palaeolithic and Mesolithic archaeology of similar age to those found at Aveline's Hole. The famous 'Cheddar Man' skeleton discovered here in Gough's Cave in 1903 is of a very similar date to the Mesolithic cemetery at Aveline's Hole. We have, so far, investigated four of the caves in this group, Gough's Cave, Gough's Old Cave, Great Oone's Hole and Long Hole. At present, only Long Hole has yielded engravings of this type but work continues at all of the other sites. Long Hole is an elliptical tube leading back into the hillside for a total of 250 m. The engravings are located on the west wall of a small chamber, about 70 m from the entrance. Whilst not the actual end of the cave, the way on from this chamber is up an awkward 5 m climb and so it may be regarded as the effective end of the cave. Three separate engravings have been located in this chamber and two of these are shown in the accompanying photographs. All three engravings are rectilinear abstract designs made with sub-parallel groups of two or three lines. The lines appear to have been cut with stone tools, although with a much thinner, finer blade than the Aveline's Hole crosses. Again there is a degree of patination characteristic of considerable age. In contrast there is a far brighter scratch on the largest engraving. 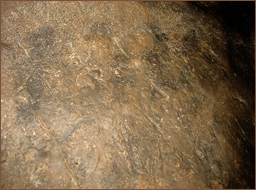 In appearance this is characteristic of much of the later graffiti elsewhere in the cave, but it is impossible to estimate the age of the scratch as there is little discernible difference in brightness of appearance between graffiti no more than 10 years old and older initials and dates over the last 300 years. On stylistic grounds we are again attributing the engravings to the Mesolithic, rather than the Palaeolithic because, as in the case of the Aveline's Hole panel, such abstract designs are more characteristic of that period. Although abstract designs are found in the Palaeolithic, they are almost always in conjunction with representational art. It is important to note that the attribution of these engravings is far less secure than that of the Aveline's Hole material. Long Hole has, in effect, always been open and visited. It is known to have been used in Roman times (Branigan & Dearne 1991) and contains graffiti dating as far back as 1668. 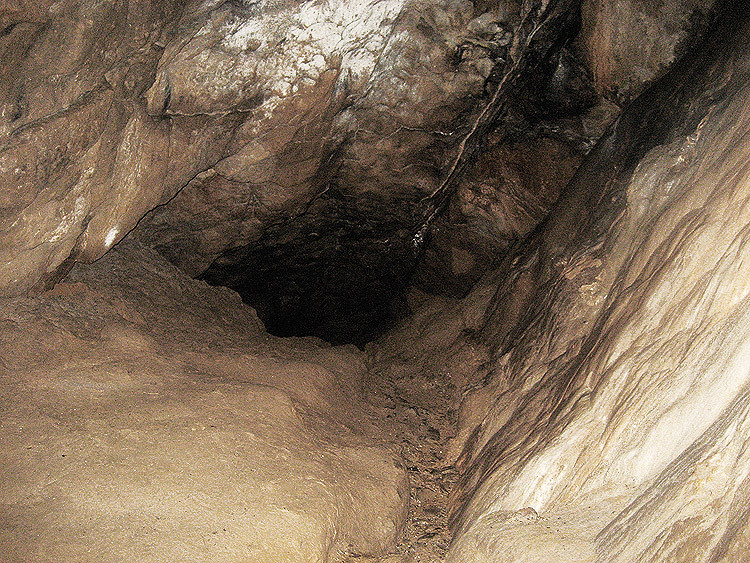 As far as the archaeological content is concerned, Tratman (1966) dug some trial trenches in the cave and found that the deposits had been 'completely disturbed'; in addition, Jacobi (2004) notes that, despite previous attributions, no material of Palaeolithic age is known with any certainty to have come from this cave. 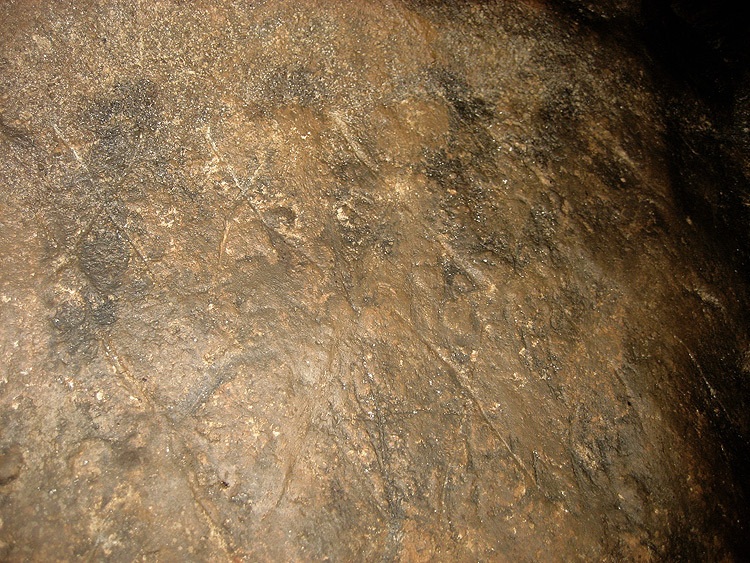 However, although the immediate archaeological context for these engravings is not secure, both Palaeolithic and Mesolithic archaeology can be found in abundance in the surrounding caves, notably Gough's Cave, and it is not uncommon in France and Spain to find cave art in situations removed from the archaeology. A similar situation is also found at Creswell Crags. We are prepared, therefore, relying on their condition and on stylistic parallels to give this group of engravings a tentative attribution to the Mesolithic. While a later date cannot be ruled out, this attribution is more parsimonious, given what we do know of the local archaeology. It must be stressed that this work is very much in its early stages and that, as yet, the entire body of art is still very small and so any attempts at interpreting the intentions of its makers must be extremely tentative. 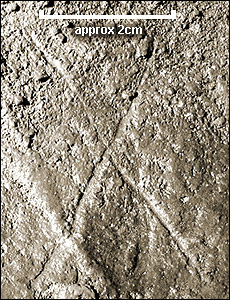 The most that can be said, at present, is that taking the archaeological evidence, especially that from Aveline's Hole, into account and assuming that our attribution of this work as Early Mesolithic is correct, then it might be said that it is unlikely to be coincidental that these engravings were made at a time, the Early Mesolithic, when man was first beginning to show signs of settling in discreet areas of the landscape as opposed to continually moving through it as he had during Palaeolithic times. In the context of Aveline's Hole, especially, this is happening at the same time, or possibly subsequent to, the appearance of a well developed sense of personal adornment (Mullan & Wilson 2005), although it is still too early to judge what, if any, aesthetic impulse might be behind these works. This is, we accept, not in line with the conclusions that have been drawn from the engravings in Church Hole, some, at least, of which were made significantly earlier than the Early Mesolithic dates we are attributing to our finds but we must reiterate that interpretation is difficult with such a small sample of material from such a small number of sites.